Periodically I take groups on culinary tours where we undertake hands-on foodcraft classes as well as some touristic opportunities around local cuisine. Six nights at a family-owned hotel on the Adriatic Coast, in the heart of Romagna. All meals, including drinks and local wine selection. 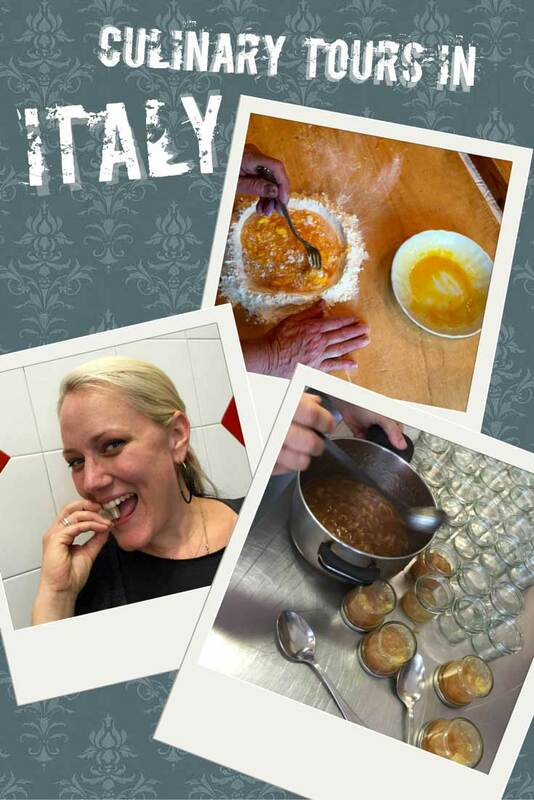 Experience the food culture of Emilia-Romagna including hands-on cooking classes. Forage for porcini mushrooms in the Apennine mountains, and learn to cook with them. Attend a traditional sagra, a festival of truffles in a quaint medieval town. Make savòr, a local conserve of autumn fruits and nuts with a local artisan jam maker. Make hand-rolled pasta with a sfoglina, or pasta maker. Make piadina, the local flatbread of Romagna, at Casa Artusi, a museo del gusto. Experience formaggio di fossa, sheep's milk cheese that's stored in limestone pits. Shop the markets of Bologna, and cook a delicious meal from them. An English-speaking guide throughout the tour. Click here for the full itinerary and logistics. Price per person, based on double occupancy, is 3,500 USD. Single accommodation is available for an additional 500 USD. Interested in joining? Sign up for our newsletter to stay informed of future itineraries. Learn how to make hand-rolled pasta from scratch: Strozzapreti, cappelletti, tagliatelle, tagliolini, and passatelli, a dumpling-like pasta special to Emilia-Romagna. Go to Casa Artusi, a museo del gusto in Forlimpopoli to learn how to make piadina, the native flatbread of Romagna. We'll take you to to experience formaggio di fossa, a sheep's (sometimes cow's) milk cheese aged in tufa pits in the town of Sogliano sul Rubicone. Many people know about the famous truffle festival in Alba, but the smaller one in Sant'Agata Feltria is more intimate and full of delicious things. In October 2015, we were scheduled to forage for porcini mushrooms. Instead, we hunted for truffles. Hello! We've gone to a caseificio in Parma to watch the production of Parmigiano-Reggiano, the king of Italian cheeses. This is a truly artisanal production done on a large scale. We also went to an acetaia to learn about the production of Aceto Balsamico Tradizionale di Modena -- true balsamic vinegar, not the stuff you find on the grocery store shelves.